Braeton Connection and Zojak World Wide are pleased to be able to present the A Major Riddim, a carefully constructed roots and culture riddim that is made for the 2009 summer reggae experience. Conscious reggae artists Anthony B, Lutan Fyah and Perfect present a trinity of catchy lyrics, conscious messages and Rasta fiya while Singer J, Prestige, Fyahkin and more bring an edge that make the riddim stand up in the dance and on the airwaves. 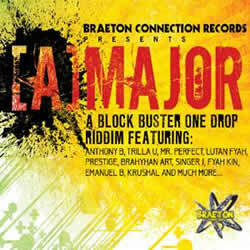 The A Major Riddim is available now on Itunes and other fine e-tailers. Anthony B is the first to ride the A Major’s shimmery almost celtic melody on “Jah Light”. Dodging sharp bass lines Lutan Fyah comes forward with poignant words of inspiration on “Good Over Evil”. Perfect’s sticks to the formula that blessed him with the image of a young man beyond his years on the Rasta tinged wisdom of “Jah Love”. And Singer J’s melancholy vocals on “Bad Mind” leave a refreshing edginess to the bright spirit of the A Major Riddim. Out from under the shadow created by the lovers harmony group L.U.S.T., Thrilla U shines with human emotion on “Child Cry”. The A Major Riddim’s solid cultural credentials are burnished by the innovative quality of up-and-comers like Fyahkin (“Work Hard”), Prestige (“Equal Rights”) and Mikey Pelpa (“Cold Hearted”) whose sharp social commentary contrasts well with the uplifting musical vibes. “Love People” is another song to listen for-balancing on Brahyan Art’s strong lyrics and melodic skill. Classikal Eska, who comes direct with a mixture of sluggish singing and rapid fire rhymes, is another track not too miss. From roots to dancehall, groovy melodies to edgy bass lines, the A Major Riddim will keep the consciousness and reggae spirit flowing in a major way all summer long.